Dogs are smart animals! They can learn to herd cattle and help the disabled. The phrase you can’t teach an old dog new tricks doesn’t apply to one little girl and her pal. Especially when it comes to a hula hoop. 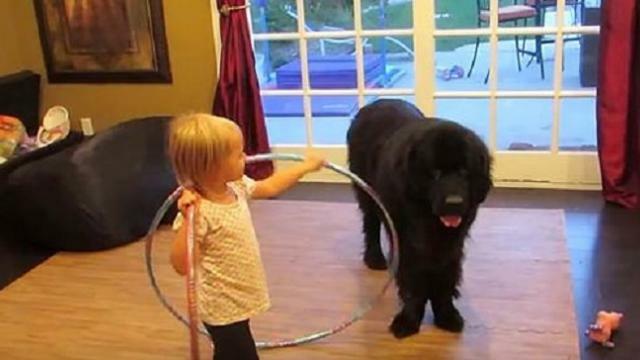 That’s why this adorable little girl named Sierra is hoping that her dog Bucky can learn how to hula-hoop! She’s mastered the technique herself and now she wants to teach her furry best friend to do the same. With a tone of encouragement and reassurance, Sierra grabs two hula hoops and places one around Bucky’s neck. What happens next is just too cute for words! According to DogTime, Newfoundlands like Bucky are the perfect family breed! They are intelligent and loving, and they also thrive when given a responsibility (like looking after little ones)! Even though they can grow up to 150 pounds as an adult and are relatively mellow creatures, Newfoundlands crave mental stimulation and exercise. That’s why one was used as the caretaker, Nana, by playwright J. M. Barrie in his 1904 play Peter Pan. Their gentle demeanor and “pack horse” mentality make them perfect for a home full of children, just like Sierra’s. It also means Bucky is incredibly tolerant of his teacher, Sierra, who is determined that he learns a new trick. Sierra excitedly places the hula hoop around Bucky and waits patiently for him to start swinging it around. When Bucky steps out of the hula hoop, Sierra doesn’t lose her patience. Instead, she decides it’s best for him to see how to hula hoop firsthand! She hikes up her own hoop and whirls it around her body! Then she looks at Bucky, gives him a short, encouraging pep talk and pauses her lesson to share some affection! It’s clear Bucky and Sierra are two peas in a pod. While hula-hooping might be impossible for Bucky, his loving pal Sierra will never give up on him. They are the cutest!